Wells Fargo, JPMorgan and Citi all started 2018 with the gift of lower taxes. Fourth-quarter earnings show the similarities end there. Treasury largesse propped up Citi and Wells, accounting for most of their underlying growth. JPMorgan gave back most, and needed the help least. 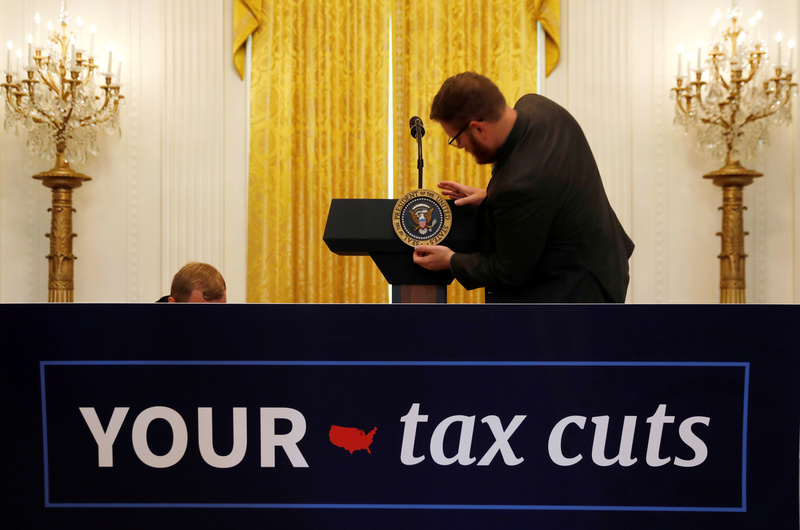 The Presidential seal is placed upon the lectern before U.S. President Donald Trump delivers remarks celebrating six months since his tax cuts victory at the White House in Washington, U.S., June 29, 2018. JPMorgan on Jan. 15 reported earnings of $7.1 billion for the last three months of 2018, equivalent to $1.98 per share. That compared with analyst forecasts of $2.21 per share, according to I/B/E/S estimates from Refinitiv. Revenue of $26.8 billion was in line with estimates for the quarter. That was on a managed basis, which presents revenue from tax-exempt securities and investments that receive tax credits on a comparable basis to taxable investments and securities. Rival U.S. lender Wells Fargo said on the same day that its earnings were $6.1 billion for the final quarter, or $1.21 per share, compared with analyst estimates of $1.18. Its revenue of $21 billion fell short of forecasts of $21.7 billion. The company earned $6.2 billion on revenue of $22.1 billion in the same period a year earlier. JPMorgan’s revenue from fixed-income trading fell 18 percent year-on-year in the fourth quarter, excluding the impact of the 2018 U.S. tax cuts. Rival Citigroup said on Jan. 14 that its own trading revenue from fixed income fell 21 percent.